"Many consumers have no idea how much sugar and salt is in their food," said Professor JoAnn Manson (from left), who believes the new food labels will pressure food manufacturers to address the issue. Joining Manson for the HSPH forum discussion “Sugar, Salt, and Supplements: Sorting the Science” were Associate Professor Dariush Mozaffarian and Professor Frank Hu. The United States is simply too sweet for its own good. Even the “healthy” fruit drinks that Americans sip are packed with the amount of sugar in six cookies. That love affair is making us sick. 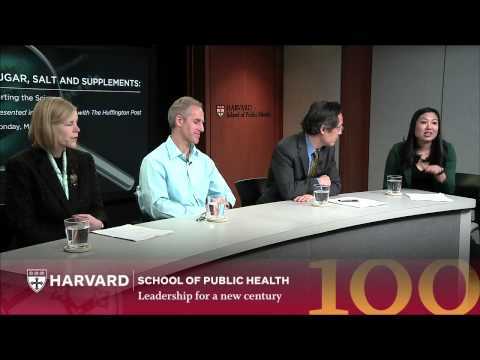 Hu spoke at the HSPH panel “Sugar, Salt, and Supplements: Sorting the Science” on Monday, just weeks after the U.S. Food and Drug Administration announced its first overhaul of food-product labels in 20 years. The revamped labels will provide consumers with nutrition facts, calorie counts in boldface type, and realistic serving sizes. They also will also disclose how much sugar manufacturers add to their products, all with an eye toward helping the public make healthier eating choices. Hu, who is also a professor of medicine at Harvard Medical School (HMS) and Channing Lab at Brigham and Women’s Hospital, pointed to the health consequences of failing to act. Centers for Disease Control studies show that people who get more than 10 percent of their daily calories from products with added sugar had a 40 percent increased risk of dying of heart disease, Hu said. Panelist Dariush Mozaffarian ’06, an associate professor in epidemiology at HSPH, warned that the dietary focus should also be on targeting “poor-quality carbohydrates” such as refined grains, potatoes, and sugar. Hu said the new labeling system would be a relatively easy way to count empty calories in sugar, compared with the more complicate tracking of refined starch in foods such as bagels and potatoes. He also supports government programs like ones that ban sales of sugary drinks or large sodas. Panelist JoAnn Manson ’75, professor in epidemiology at HSPH and chief of preventive medicine at the Brigham, said the new food labels will prove critical to pressuring food manufacturers to reduce the levels of added sugar and salt. The panel, presented in collaboration with the Huffington Post and moderated by its senior editor for health news, Amanda Chan, also addressed the latest scientific data on salt intake. Some Americans try to make up for their bad eating habits by taking multivitamins and supplements like fish oil. Manson said everyone needs vitamin D, and the recommended adult guideline is 800 IUs (international units) with calcium for bone health. But the jury is still out on whether greater amounts might prevent cancer and cardiovascular disease. Testing is being done on doses of 2,000 IUs daily, she added. Still, Manson said the “jury is still out” as to whether many supplements are safe and effective. “There will never be a replacement for a healthy, well-balanced diet,” Manson said. Male narwhals have one spiral tooth that projects through the upper lip, jutting nine feet out from only one side of the head. Here they are seen swimming off Baffin Island, Canada.